Nothing could be so pinching and depressing for a pair of women vying and dying to be crowned as the Miss Universe when the hostannouces a wrong decision that was not even written. As the Miss World grand finale was about to be wrapped up with the announcement of the Miss World with tow finalists Miss Colombia and Miss Philippines were finally left on the stage, there came in Steve Harvey announced the bombshell: Miss Columbia to be the Miss Universe. Much the the disgust of Miss Philippines who was certain sure to be crowned as the Miss Universe 2015, Miss Columbia was crowned much to her surprise. She was bowing and throwing flying kisses to the roaring audience, when the anti-climax came for her. 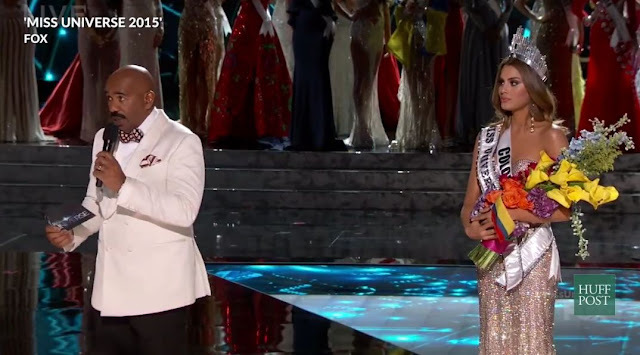 Steve Harvey announced that he has made a mistake and that the actual Miss Universe was Miss Philippines.